The Okavango Delta, the remnant of a vast inland lake, has gone through immense changes over the centuries, with shifting land masses and desertification, and even today the forces of nature and geology continue to affect it existence. The water levels in the Okavango change from year to year, and are dependent on the amount of rainfall locally and in the catchment areas in the highlands of Angola. The highest levels of the recent decades can be determined in the grasses on the floodplains, but there were times in the past when the flow was minimal, and even non-existent. The presence of termite mounds in the permanent waters of the northern delta, indicate dramatic epochs in the climate of the region. These mounds reveal a time when the delta was very low, with minimal flow. For Termites to start a colony conditions have to be dry but moist, not flooded. For this reason the Termite mounds in the permanent delta indicate that the area was once dry. The area had to have been dry for the Termites to have built the nest initially as they would not survive in waterlogged areas. Adding to the intrigue of the place is the realization that the river may not have flowed for a period of time. Another plausible explanation for the termite mound in the permanent delta is that there was a mass blockage that could have starved those parts of the northern delta of water. The changes in the flow of the delta can also be experienced in the patterns on the earth which can be seen from the air whilst flying over the northern wilderness areas of Botswana. What seems barren ground to the casual eye actually shows patterns of ancient floodplains and islands. These patterns indicate the flow of the delta in times past or can be an indication of how high the water levels have been when combined with the present area of the delta. 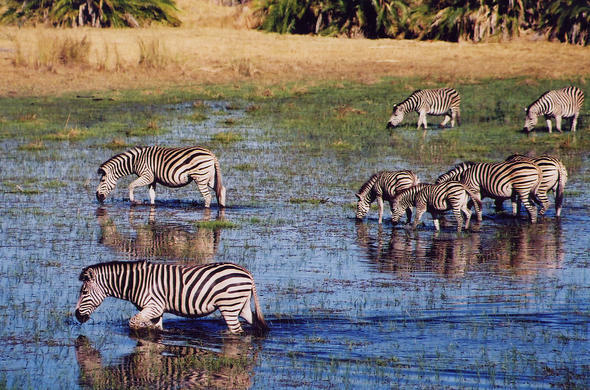 A safari to the Okavango Delta is one of the highlights for regular African Safari travelers but often there is disappointment when the experience does not live up to expectations. This disappointment is mostly to do with water levels - either when the area is visited at a different time of the year than previously or if the water flow has been altered by blockages, low rainfall or earth shifts. The flow of the water in the Okavango cannot be predicted and instead of having expectations for a safari guests should expect the unexpected from this unique natural wonder.